How many times have you had to make renovations to your doors? 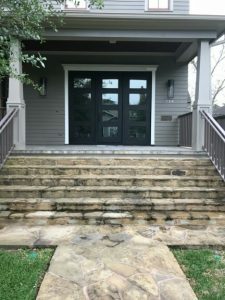 Some doors are susceptible to water damage or they do not have the kind of requirements that can protect from being warped. There seem to be many issues that one must be mindful of when taking care of a door. However, we want to show you that you don’t have to sacrifice so much for a great door. Our blog post today will demonstrate the value of a low maintenance door. At Southern Front we know our customers have many obstacles to hurdle in their lives, that’s why we want to create products for you that are as hassle-free as possible. What Kind of Maintenance Do Doors Require? One of the biggest issues for any door is its durability. How long can it last against the elements and is it strong enough to take some hits? These are questions that are frequently asked about doors, and they become trickier to answer depending on the kinds of doors. For example, you may find you’re interested in a solid wood door. It may have beautiful carvings and a gorgeous stain. However, what it does not have is protection against rotting. If it gets wet or dirty, mold and other unsavory effects can infect the door and sap it of its integrity. Other examples include doors made of steel. Though they may be strong and attractive, a steel door can be prone to rust and if it gets hit, denting. These are very costly effects that can completely ruin your doors and require constant maintenance. What Types Of Doors Can Lower My Maintenance? 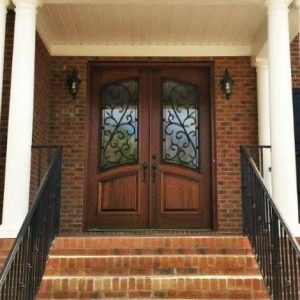 Southern Front Doors offers an extensive line of options that are very low maintenance. We’ve noticed the drawbacks of other doors and have taken that into account. All of the doors we offer are made with an internal rot and warp resistant composite threshold. Our premium doors offer long term protection. Whether it be made of wood, steel or fiberglass there are no worries when it comes to water damage. As for the issues of rust, some issues are unavoidable costs, but we have made sure to include warranties from our manufacturers to continue alleviating your expenses. When it comes to denting though, every one of our steel doors offers an 18-gauge dent resistant frame. 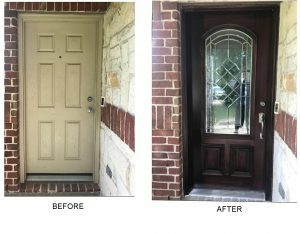 At Southern Front, every door is made with such high quality the amount of work required is slim when compared to that of other doors on the market. Contact Us Now To Find The Best Option For You! We understand the shortcomings of many doors and have worked to make them as little of an issue as possible. This way, you can enjoy the benefits of your doors rather than worry about when they may break. It will add so much value to your house purely by the peace of mind. You won’t have to worry when a storm blows in, or if the dent can be fixed. Just that alone will do wonders to your state of mind. Our goal at Southern Front is to help our customers get the best option whilst saving money and time!